AS EMPRESAS BRASILEIRAS DE CAPITAL FECHADO SÃO MAIS AGRESSIVAS EM SUAS EFFECTIVE TAX RATE (ETR) DO QUE AS DE CAPITAL ABERTO? Palavras-chave: Empresas de Capital Fechado e Aberto. Effective Tax Rate. Setores Econômicos. Ciclo de Vida Organizacional. No Brasil existe uma lacuna de estudos comparativos sobre a determinação da Effective Tax Rate (ETR) entre as empresas abertas e fechadas. Neste contexto, este trabalho busca contribuir para a incipiente discussão assumindo a hipótese de que as empresas brasileiras de capital fechado são propensas a apresentarem ETR mais agressivas do que as de capital aberto. Para isso, foram estimados modelos de regressão (OLS – Ordinary Least Square, e LSDV - Least Square Dummy Variables) para investigar o poder explicativo da variável de interesse (empresas de capital fechado ou aberto) em relação a variável dependente (ETR), controlando por setores econômicos e ciclo de vida organizacional de 668 firmas brasileiras no período de 2010 a 2015. Os resultados indicaram que: (i) empresas brasileiras de capital fechado apresentam ETRs menores em relação às empresas abertas (aproximadamente 45,53%) e, (ii) os estágios de maturidade e turbulência do ciclo de vida organizacional têm relação indireta com a ETR (aproximadamente 6%).Palavras-chave: Empresas de Capital Fechado e Aberto. Effective Tax Rate. Setores Econômicos. Ciclo de Vida Organizacional. ARMSTRONG, C. S.; BLOUIN, J.L. ; LARCKER, D. F. The Incentives for Tax Planning. Journal of Accounting and Economics, vol. 53, 2012, pp. 391-411. CHEN, S.; CHEN, X.; CHENG, Q.; SHEVLIN. Are family firms more tax aggressive than non-family firms? Journal of Financial Economics, vol. 95, n. 1, 2010, pp. 41-61. CLOYD, C. B.; PRATT, J.; STOCK, T. The use of financial accounting choice to support aggressive tax positions: Public and private firms. Journal of Accounting research, 1996, pp. 23-43. DESAI, M. A.; DHARMAPALA, D. Corporate tax avoidance and high-powered incentives. Journal of Financial Economics. Vol. 79, 2006, pp. 145-179. DICKINSON, V. Cash flow patterns as a proxy for firm life cycle. The Accounting Review, vol. 86, n. 6, 2011, pp. 1969–1994. DHALIWAL, D. S.; GLEASON, C. A.; MILLS, L. F. Last‐chance earnings management: using the tax expense to meet analysts' forecasts. Contemporary Accounting Research, vol. 21, n. 2, 2014, pp. 431-459. DYRENG, S.; HANLON, M.; MAYDEW. ETR Long-run corporate tax avoidance. The Accounting Review. Vol. 83, n. 1, 2008, pp. 61-82. DYRENG, S. D.; HANLON, M.; MAYDEW, E. L. The effects of executives on corporate tax avoidance. The Accounting Review, vol. 85, n. 4, 2010, pp. 1163-1189. DYRENG, S. D.; HANLON, M.; MAYDEW, E. L.; THORNOCK, J. R. Changes in corporate effective tax rates over the past 25 years. Journal of Financial Economics, vol. 124, n. 3, 2017, pp. 441-463. FÁVERO, L. P.; BELFIORE, P.; TAKAMATSU, R. T.; SUZART, J. Métodos Quantitativos com Stata: procedimentos, rotinas e análise de resultados. Rio de Janeiro: Elsevier, 2014. FERNÁNDEZ-RODRÍGUEZ, E.; MARTÍNEZ-ARIAS, A. Determinants of the Effective Tax Rate in the BRIC Countries. Emerging Markets Finance and Trade, vol. 50, 2014, pp. 214-228. GRAHAM, J. R.; HANLON, M.; SHEVLIN, T.; SHROFF, N. Incentives for tax planning and avoidance: Evidence from the field. The Accounting Review, vol. 89, n. 3, 2014, pp. 991-1023. GUJARATI, D. M.; PORTER, D. C. Econometria Básica. 5 ed., Porto Alegre: AMGH, 2011. GUPTA, S.; NEWBERRY, K. Determinants of the variability in corporate effective tax rates: Evidence from longitudinal data. Journal of Accounting and Public Policy, vol. 16, n. 1, 1997, pp. 1-34. HANLON, M.; HEITZMAN, S. A review of tax research. Journal of Accounting and Economics, vol. 50, 2010, pp. 127-178. HASAN, M. M.; AL-HADI, A.; TAYLOR, G.; RICHARDSON, G. Does a Firm’s Life Cycle Explain Its Propensity to Engage in Corporate Tax Avoidance? European Accounting Review, 2016, pp. 1-33. HOPE, O-K.; MA, M.; THOMAS, W. B. Tax avoidance and geographic earnings disclosure. Journal of Accounting and Economics, vol. 56, n. 2–3, 2013, pp. 170–189. JACOB, M.; ROHLFING-BASTIAN, A.; SANDNER, K. Why do not all firms engage in tax avoidance? Facct Center Working Paper, 19, 2014. KRAFT, A. What really affects German firms’ Effective Tax Rate? International Journal of Financial Research, vol. 5, n. 3, 2014, pp. 1-19. LAW, K.; MILLS, L. F. Taxes and Financial Constraints: Evidence from Linguistic Cues. Journal of Accounting Research, vol. 53, n. 4, 2015, pp. 777–819. LIN, S.; TONG, N.; TUCKER, A. L. Corporate tax aggression and debt. Journal of Banking & Finance, vol. 40, 2014, pp. 227-241. LIN, K. Z.; MILLS, L. F.; ZHANG, F. Public versus private firm responses to the tax rate reduction in China. The Journal of the American Taxation Association, vol. 36, n. 1, 2013, pp. 137-163. LIU, X.; Cao, S. Determinants of Corporate Effective Tax Rates: Evidence from listed companies in China. The Chinese Economy, vol. 40, 2007, pp. 49-67. MILLS, L. F.; SANSING, R. C. Strategic Tax and Financial Reporting Decisions: theory and evidence. Contemporary Accounting Research, vol. 17, n. 1, 2000, pp. 85–106. MILLS, L. F.; NEWBERRY, K. The influence of tax and non-tax costs on book-tax reporting differences: public and private firms. Journal of the American Taxation Association, vol. 23, n. 1, 2001, pp. 1–19. PARISI, V. The determinants of Italy’s corporate tax rates: an empirical investigation. Public and Municipal Finance, vol. 5, n. 1, 2016. PENNO, M.; SIMON, D. Accounting Choices: Public versus Private Firms. Journal of Business Finance & Accounting, vol. 13, 1986, pp. 561-569. PIERK, J. Are Private Firms Really More Tax Aggressive than Public Firms? WU International Taxation Research Paper Series. Vol 2, 2016. PLESKO, G. A. An evaluation of alternative measures of corporate tax rates. Journal of Accounting and Economics, vol. 35, n. 2, 2003, pp. 201-226. REGO, S. O. Tax-Avoidance Activities of U.S. Multinational Corporations. Contemporary Accounting Research, vol. 20, n. 4, 2003, pp. 805-833. 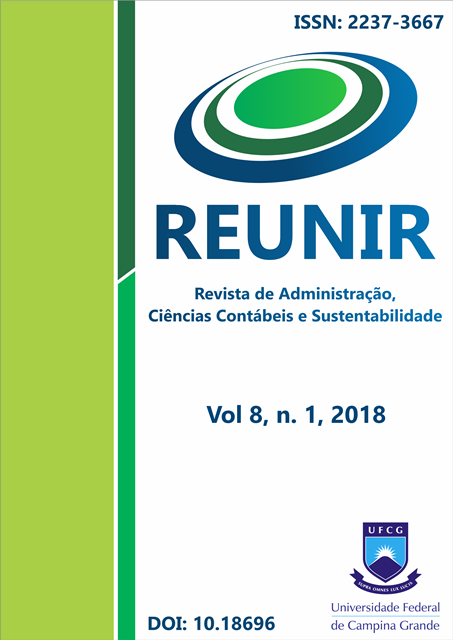 RIBEIRO, A. I. M.; CERQUEIRA, A.; BRANDÃO, E. The Determinants of Effective Tax Rates: Firms’ Characteristics and Corporate Governance, n. 567, 2015. Universidade do Porto, Faculdade de Economia do Porto. RICHARDSON, G.; LANIS, R. Determinants of the variability in corporate effective tax rates and tax reform: Evidence from Australia. Journal of Accounting and Public Policy, vol. 26, n. 6, 2007, pp. 689-704. SANTOS, M. A. C.; CAVALCANTE, P. R. N.; RODRIGUES, R. N. Tamanho da firma e outros determinantes da tributação efetiva sobre o lucro no brasil. Advances in Scientific and Applied Accounting – ASAA, vol. 6, n. 2, 2013, pp. 179-210. SHACKELFORD, D. A.; SHEVLIN, T. Empirical tax research in accounting. Journal of Accounting and Economics, vol. 31, n. 1-3, 2001, pp. 321-387. SIEGFRIED, J. The Relationship Between Economic Structure and the Effect of Political Influence: Empirical Evidence from the Federal Corporation Income Tax Program. 1972. Dissertation, University of Wisconsin. SILVA, J. M. A influência do ciclo de vida organizacional sobre o nível de planejamento tributário. 2016. Tese de Doutorado. USP. Ribeirão Preto. STICKNEY, C. P.; McGEE, V. E. Effective corporate tax rates the effect of size, capital intensity, leverage, and other factors. Journal of accounting and public policy, vol. 1, n. 2, 1982, pp. 125-152. TAYLOR, G.; RICHARDSON, G. Incentives for corporate tax planning and reporting: Empirical evidence from Australia. Journal of Contemporary Accounting & Economics, vol. 10, 2014, pp. 1-15. WATTS, R. L.; ZIMMERMAN, J. L. Positive Accounting Theory. New Jersey: Prentice-Hall, 1986. ZIMMERMAN, J. L. Taxes and firm size. Journal of Accounting and Economics, Noth-Holland, vol. 5, 1983, pp. 119-149.